Transportation generally available in Moscow today is a legacy of the ruling communist reign of more than 70 years ago. There is a look outdated, some are good and efficient. Coming to Russia now, you may have the opportunity to see a bit of the communist past glory of the transport that will soon be lost as a result of the changing times. Enjoy the beauty of Moscow can be reached with various types of transportation in the city. Marshrutka, trolley buses, tramway, awtobus, metro, and taxis. Do not be afraid to try all of those vehicles. Each vehicle has its own uniqueness and enjoyment. Following review of public transport in Moscow. Both forms of transportation such as public transportation buses. That being different is a trolley bus runs using electricity, while awtobus using gasoline. Each bus use numbers and include the name of the final destination.On the right side of the vehicle body, usually written regions will be passed making it easier for passengers to identify the direction of the bus.Awtobus and trolley bus tickets can be purchased at ticket kiosks located near the bus stop. Usually almost all the bus stop near the metro station has a ticket booth in question. If no stop near ticket booths, bus tickets can be purchased through the bus driver. What is different is that tickets are usually sold at the counter cheaper than that sold by the driver. Bus driver units only sell tickets, while tickets at the counter could sell in large quantities. During use awtobus / trolley bus, always pay attention to announcements are voiced over loudspeakers. This tool will say name of the next stop will soon stop off the bus. Press the stop sign located near the exit or just standing near the exit. The driver will know if there are passengers who would come out. Public transportation is such a small vehicle that is usually found in southeastern and south Asian countries. Marshrutka mileage is usually relatively short. Marshrutka linking the metro stations with other stations making it easier for passengers to get to the nearest metro station. Using the number sign to distinguish the direction and majors, respectively, each one using a marshrutka costs about 25 rubles. Marshrutka conductor so that the driver does not have to work alone in control of a vehicle while picking up the cost of passengers. If you sit near the driver or rather behind the driver seat, do not be surprised if other passengers for help to pass on the cost to the driver and the driver will give a refund to you, and then given to the passengers.No one complained when his change is less. No one objected and no debt. Appears are fully confident that all passengers will help.An exemplary honesty lesson by anyone. Tramway is a train that is driven by electricity and running in the middle of the highway in conjunction with other vehicles. which is different from the trolley bus is tramway has its own rail line is located on the highway though and jostle with other vehicles. As with other public transport, tramway marked with numbers that show the final destination of each tramway. In the body of the train is also equipped with the right area and stop the name that will be passed.In addition, there is always an announcement that will immediately stop destination. Tramway ticket as ticket awtobus / trolley bus which can be purchased at the ticket window or by the driver. So, if travelers have awtobus ticket, but can be used for use awtobus, also can be used for trolley buses and tramway. It is better to avoid using this vehicle unless it is intended area can only be bypassed by tramway, tramway speed is extremely slow. Taxis are the most expensive public transportation because it is personal and can lead to the front door of their destination. Official taxis in Moscow is not much that many emerging black cab. Do not be surprised if you see a person on the side of the road lay a personal vehicle. Motorists will open a window, looks a little chat and invite people who dismiss to get into the car. People who are seeking to dismiss was indeed a dark cab. This is a very plural performed in Moscow and several other Russian cities.When the driver looks a bit talk with passengers, in fact the two sides were bargaining the price. Using dark cabs do not because there are official taxis, but the Russians prefer practicality. Stop at the curb and lay off passing vehicles. For them, call a cab requires patience itself because usually had to wait in a long time. To recognize the dark cab, they usually use a vehicle that is made in the days of the Soviet Union, such ZIGULI box-shaped and Pepper. 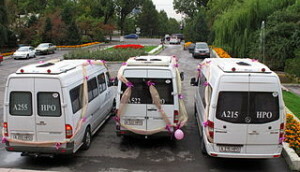 They are often looking for a passenger with a stop near the bus stop or nearby metro station. Dark cab fare for a short distance is equal to 100 rubles. When compared with the official taxi fare using the meter, so open the door, the meter would show has put forward the numbers 300-400 rubles.Of the meter will run according to the distance and travel time.To use official taxis, in addition to book over the phone, can also directly come to the regular taxi stop. It’s official taxi using a relatively new vehicle. Price is directly proportional to the quality. If not forced, it is advisable not to use illegal cabs unless already speak Russian well. This is important because some illegal taxis sometimes ask for additional money when it comes to goals.